With such a pleasant name as the seaside sanatorium you would think it was the place to be if you were unwell. However pretty much any sanatorium of the early 1900's was to be avoided, no matter how sick you were. Built in 1934 and opening its doors the same year, it originally started as a centre to treat children with turburculosis. This continued until 1958 when it was turned into a home for the elderly, during this time it was known as the Seaside geriatric hospital. It only lasted for three years as an elderly home until it was renamed the Seaside regional centre for the mentally retarded. During this time it treated many people for all types of things which were considered symptoms of metal retardation, but more often than not the things people were treated for had nothing to do with their state of mind. Normally in any sanatorium there were quite high death rates, mainly due to the lack of proper medicines and next to no understanding of how to treat their symptoms, but the seaside sanatorium had a much higher rate than most. There are many stories of abuse and all kinds of mistreatment here, and during the 1970's people started to know something wasn't quite right. The death rates continued to climb much higher than other sanatoriums and in 1996 the centre was finally closed down due to the growing reports of unnecessary deaths and abuse. Today the building stands abandoned and in poor shape. The outside is mostly rotten and the interior is filled with graffiti and signs of vandalism. Is the Seaside Sanatorium Haunted? Normally with any building of this type that has a history as it does, it would be surprising if people didn't make up a ghost story or two. That combined with how spooky the building generally looks and the fact that a lot of people have been able to go inside would lead me to believe that most tales of this place are nothing more than camp fire stories. However if anywhere is going to be haunted this place should definitely be on the list. The stories of the ghostly happenings here are mostly focused around unexplainable sounds and apparitions. There is a good source for paranormal activity though, and that comes from the unusually high death rate the building has seen. One of the many claims against the sanatorium when it was open was why there was no explaination as to the high rates of suicides. Reports of all kinds of abuse made by the staff on the patients is most probably the reason so many people took their lives here, with some estimates being in the low hundreds for the total amount of deaths, but a lot of these would easily be put down to illness's. 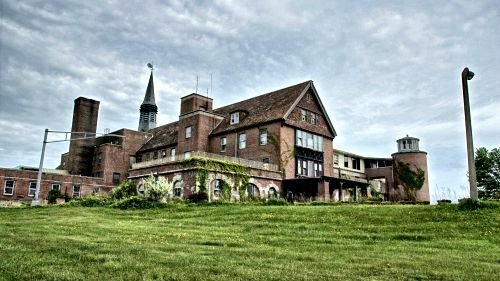 People have claimed to have seen the apparitions of the patients walking round in their gowns, in all areas of the building, especially on the top floor where most of the bedrooms were. There is also a lot of strange sounds within the walls, such as loud bangs and the sound of something heavy being dragged across the upper floors.